A visit to Bangkok is always an epic experience, one that amazes, startles, bewilders and enlightens all at once. For those staying in luxury hotels, there is no doubt a chance to enjoy relaxing in a superb, air-conditioned room will often come as a special treat; a chance to take time out before plunging back into the midst of another incredible cultural, culinary or natural experience. The last of these aspects is often overlooked in a city that offers such an exciting blend of tradition and modernity, but the wonders of Thai flora and fauna should not be ignored – in particular, the reptilian variety. Bangkok’s own snake farm offers a chance to get up close and personal with some remarkable creatures, the sort most people only see from behind the glass at a zoo. To some, that may seem the safest place, but those who come down to the Queen Saovabha Memorial Institute can be both entertained and educated by those keeping these fascinating creatures, some of which are indeed very poisonous. The public can come and see experts handling these creatures, which, contrary to what some people believe, are not slimy and do not usually have any desire to attack humans. Events held at the snake farm include venom extraction and the chance to handle and be photographed with a tame snake. There is also education on snake biology and a chance for those with medical leanings to learn more about how to treat snake bites. Demonstrations take place in a 100-seat arena. Above all, however, this is a chance to demystify these amazing creatures, to understand how they live, eat and reproduce, and how they fit into the food chain.Snake handling takes place from 14:30 p.m. on weekdays and 11:00 a.m. at weekends. 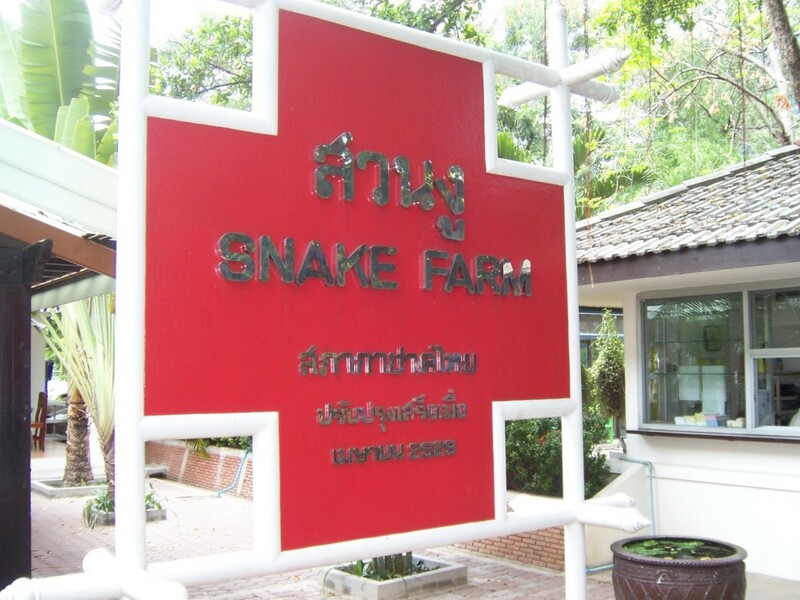 There are 35 different kinds of snake at the farm, including distinctive creatures like the wide-necked cobra, plus varieties in all sorts of sizes, bright colours and fascinating patterns.Quite simply, it is an attraction not to be missed by Bangkok visitors.